Typewritten letter from F.P. Varese, Assistant Deputy Minister of Justice, to Alfo Bacci, written on September 22, 1941, regarding the internment of Ruggero Bacci. 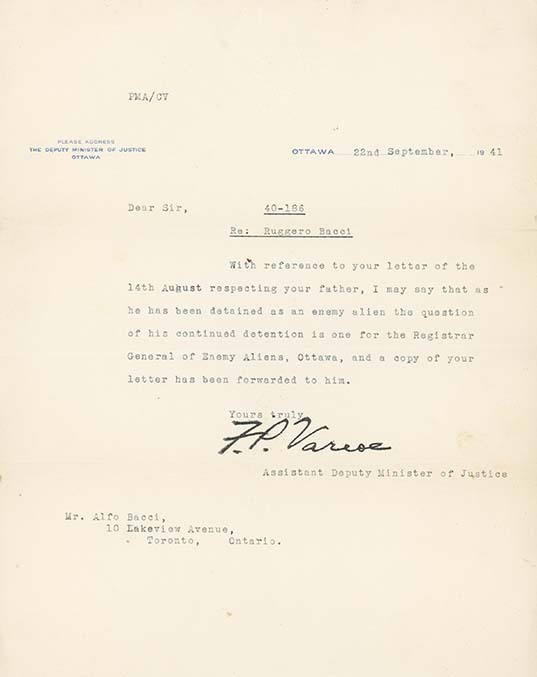 Varese notes that Bacci is being detained as an enemy alien and the continuation of his internment is under the jurisdiction of the Registrar General of Enemy Aliens, to whom he has forwarded a copy of the letter. An identical letter was sent to Alfo's older brother Aldo -- see LICEA2012-0002-0059.